If you’re planning on selling your home, finding ways to make more on your investment is always worth your time, but finding ways to increase the value of your home is also a good idea if you plan on living there for a while. It can greatly enhance your family’s quality of life and provide you with more return on your investment when you are ready to move. No matter what your reason for updating your home, the key is choosing design details that are timeless in rooms with the most potential to provide more bang for your buck. Here are 5 things you can remodel or add to your home that will skyrocket its value. You simply can’t go wrong with a remodeled kitchen . 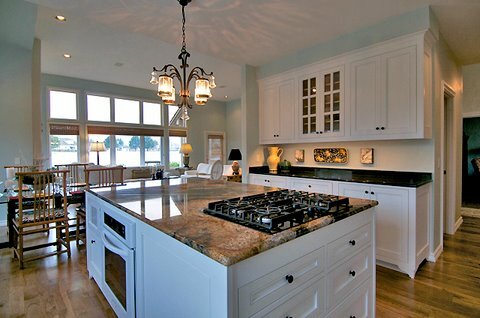 The key is choosing cabinets, countertops, and flooring that will stand the test of time. Trendy design details may be fun, but they won’t retain their value in the long run. Just look at the colorful appliances of the 1950s. Instead, fill your kitchen with stainless steel appliances, choose a natural countertop, like granite, and keep a neutral color scheme. These details make a kitchen look clean, and a clean-looking kitchen will always be in style. Next to the kitchen, the bathroom is the biggest culprit when it comes to outdated spaces. Some amazingly awful things have been done to bathrooms. Just like the colorful kitchen appliances mentioned above, toilets and tubs have come in some strange colors, the most offensive being powder pink. When remodeling your bathroom, you can greatly increase the value of your home, but only if you focus on creating a neutral, spa-like atmosphere. And of course, hire a professional to ensure that the plumbing and electrical are up-to-date. Most of us work hard, which means we want a relaxing space to rest before we do it all again the next day. For this reason, a gorgeous master suite can greatly increase the value of your home. This is also one of the easiest things to do, as it may only require you to slap a fresh coat of paint on the walls and replace the flooring. However, if the master bedroom in your home is pretty small, it may require some demolition and the creation of a master bath. Everyone can use a little extra living space, especially if there are kids involved. Unfortunately, very few basements are finished, which means they just end up being a dumping ground for boxes and old furniture. Providing more livable square footage in your house is one of the best ways to sell your home for more money. Unfortunately, finishing a basement is also one of the most challenging transformations you can undertake. There are many things to consider, like whether the walls are watertight and what kinds of permits are required. If you’re looking for a way to increase the value of your home without the disruptive construction needed with the other ideas on this list, have a custom deck installed. Your family will love having a place to grill and enjoy the weather, but it will also enhance the value of your property, encouraging home buyers to make a purchase when you’re ready to sell your house. No matter what kind of update you decide to undertake, it is important to consider your particular house and your budget. To make sure your remodeling project provides you with the most return for your money, contact us today. We can customize a new space that fits seamlessly into your home’s existing décor while greatly increasing the value of your property at the same time.